As a pioneer of built-in coffee makers, Miele is a special indulgence for coffee lovers to have in their modern homes. Miele coffee makers not only look stunning with their visually pleasing and timeless design but will also brew you a fantastic cup of coffee each and every time. Miele thinks of every small detail that will be pleasing to even the most discerning of coffee connoisseurs. Brewing your favorite coffee beverage has never been easier with the latest built-in coffee systems by Miele. With the touch of a button you can brew an espresso, cup of coffee, or even a coffee shop style milk beverage like a latte or cappuccino, all customized to your preferences. This Miele espresso machine is capable of making many popular specialty drinks with just one touch. You can choose from espresso, regular coffee, long coffee, cappuccino, cafe latte, latte macchiato. There is also a hot water spout that dispenses hot water with a maximum of about 180 degrees. The results speak for themselves and each drink is perfectly brewed everytime. For drinks requiring milk, you'll use the included glass container. The container easily slides into place and since it's clear you'll always know how much milk is left. The glass container is much easier to clean than previous versions that were stainless steel. Since it's removable, you can put the container in your refrigerator when it's not in use. The one touch system really shines with complicated drinks like the latte macchiato which requires three separate steps make. First, the brew unit will automatically lower to the height of your cup. Next, the system dispenses hot milk. Then, the machine will freshly grind coffee beans to make a strong espresso. Since the brew unit has lowered to your cup there will be minimal temperature loss from exposure to air as the espresso is dispensed. Finally, a milk froth is dispensed and sits on top of the beverage. Again lowered brew unit is the ideal distance to the glass to ensure the froth sits perfectly on top. The result is extremely impressive. Bean selection: All beans work with Miele, so you can choose any bean on the market including ground coffee or decaf. Coarseness of grind: Having more surface area for extraction (the process of water draining through the grind) means that a finer grind brings a bolder and more flavorsome brew. Miele’s ceramic conical grinder is extremely effective, and you are easily able to adjust coarseness with a small lever. Brewing temperature: Miele provides you with the option to use their default settings or choose your own temperature setting from min, low, medium, high or max. Since each bean type has a different ideal temperature, you are able to set temperatures for each drink on the user profile which comes in handy when you are experimenting with various bean types. Pre-brewing time: The pre-brewing setting determines the amount of time that the water sits in the chamber before dispensing. Portion size: You have the option to use the size system defaults or you can adjust for each drink on your user profile. You can choose the amount of water and milk that you need and save all settings, or have the machine learn your favorites without having to study a complicated menu. The Miele coffee system is all about convenience. Miele has introduced the ability to create custom drink profiles so everyone in the house can set and save their preferences. The process is extremely easy. Additional, you can brew two beverages at the same time. I have guests coming over, can I make an entire pot of coffee? Yes, you can. Miele’s coffee pot feature demonstrates the effectiveness of the pump system which is otherwise lacking in other manufacturer’s models. It enables you to make eight consecutive cups at a time or you can dispense this amount into a coffee pot so you can have it ready for when your guests arrive. Miele have introduced a stylish 1 liter coffee pot so you can serve coffee to your guests while relaxing in your home or garden. The easy to open door comfort door provides access to the internal components. Inside you'll also find a removable drip tray that comes in handy if overfill your cup. The drip tray also serves as a major component of the automatic cleaning system and will collect waste water as the system automatically rinses the coffee and milk systems. Finally you'll find waste containers for used coffee grinds. The system will automatically notify you if either the grinds or drip tray need to be emptied. To keep your Miele coffee maker working with optimum performance, regular cleaning and maintenance needs to happen. The more you look after your machine, the longer use you will get out of it. To make things slightly easier for you, Miele have included pre-programmed features to remind you when cleaning needs to take place. Daily: At the end of each day, you should clean the milk flask and lid, water tank, waste unit and drip tray. Weekly: Once a week (or more if you are a heavy user) you should clean the front of the machine, main dispenser, sensor cover, interior, inside drop tray and brew unit. You should also clean the milk valve with a cleaning brush. Monthly: The coffee bean container should be cleaned once a month and it is also suggested to lubricate the cap on the main dispenser connector. When prompted: As mentioned, the Miele coffee maker will tell you when the waste needs cleaning, along with the milk pipework, brew unit (degrease with cleaning tablets) and when the machine needs to be descaled. While most of the coffee maker parts are dishwasher safe, it’s important to only hand wash the main dispenser cover, brew unit, coffee bean container and service cover. Descaling Tablets 05626050 - As water streams through the built in coffee maker it naturally leaves calcium deposit behind. Therefore, it is recommended that you clean the coffee maker after 500-1000 uses depending on your local water hardness. Don't worry, your Miele will prompt you with a countdown alert when this maintenance task is needed. Cleaning Tablets 05626080 help clean the brew unit which is the heart of your Miele espresso machine. Milk System Pipe Cleaner 07189940 helps clean up any old milk residue. Which built-in Miele Coffee Maker should I buy? All Miele coffee machines are capable of brewing a great cup of coffee. The only difference in the availabe models are the control style and whether you need the unit to be plumbed or non-plumbed. When it comes to the two available control styles, we tend to prefer the M-Touch controls. The large touch-screen is similar to that of a modern phone or tablet. You can easily swipe and navigate to the available beverage options and settings. We are perplexed to see the direct sensor controls (not even sure what this internal jargon language means) at this day and age. However, if you are price sensitive you will notice savings of approximately $400 to make your struggle with the menu worth your while. 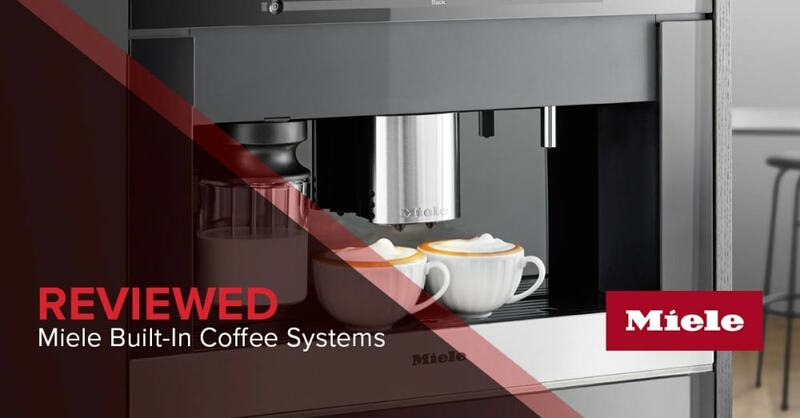 The Miele coffee system can be ordered as plumbed or non-plumbed. The plumbed version will allow you to directly connect a water supply line to the system which is a major convenience and means you won't be constantly refilling a water tank. The non-plumbed version has a water tank that needs to be refilled with water periodically. If you are on the fence about which machine to buy, the plumbed version also has a water tank, so if you don't currently have a water line but want to have the flexibility to add one in the future, we recommend going with the plumbed version. What if I don't have the space for a built-in coffee maker? Unless you are renovating or already have an older built-in machine, odds are you'll have a hard time working this into your kitchen design. Luckily you can still get all of the same great features performance in Miele's countertop coffee machines. At Designer Appliances we have complete faith in Miele's innovative and stylish coffee systems and stock four models starting from just $3,099. The Miele built-in coffee system is one of our favorite appliances. Between our staff and our customers we use this machine all day everyday without issue. Maintenance is all automatic which makes caring for the machine pain-free. We highly recommend this machine for any who loves coffee or loves to entertain. Feel free to reach out to our experts at Designer Appliances with regards to the Miele coffee maker. We all use this great espresso machine personally and happy to explain to you how it will add to your "hapiness".